Every weekend we dig into the archives. This post by Matt was originally published in April 2016. When it comes to the debate about housing and development, there’s been plenty of discussion about the physical impacts of decisions we make, for example the height and bulk of buildings. There’s even been to a lesser extent a discussion on the capital costs of development, the costs of building or upgrading roads, pipes and other infrastructure. Some of this is quite evident now with the Transport for Future Growth consultations currently underway. One area that hasn’t really been discussed at any level – other than probably some obscure high level planning papers – is the impact our development choices have on rates and operational costs. In many ways this is odd given how loudly many sections of our society protest every time rates are increased. But there is a clear link between rates and the types of development we allow. A few weeks ago there was another fantastic Auckland Conversations talk, this time by Joe Minicozzi. Joe Minicozzi, Principal of Urban3, pioneers in geo-spatial representation of economic productivity. This helps communities make better decisions through the understanding of data and design. Joe’s work has prompted a paradigm shift in understanding the economic potency of well designed cities. Joe’s multidisciplinary expertise with city planning in the public and private sectors, as well as his ingenuity with real estate finance, prompted the development of his award-winning analytical tools that have been featured in The Wall Street Journal, Planetizen, Planning, and New Urban News. Urban3’s research illustrates the benefits of urban density, heritage conservation and mixed-use developments. These have an economic impact that lead to creating sustainable and vibrant cities. If you follow many of the discussions the council has on planning and rates issues in Auckland you’ll notice is there’s a huge contradiction between the rhetoric of some groups and councillors towards rates and debt, and the land use/urban polices they also promote. Some parts of the presentation reference work Kent has produced and written about on the blog before. 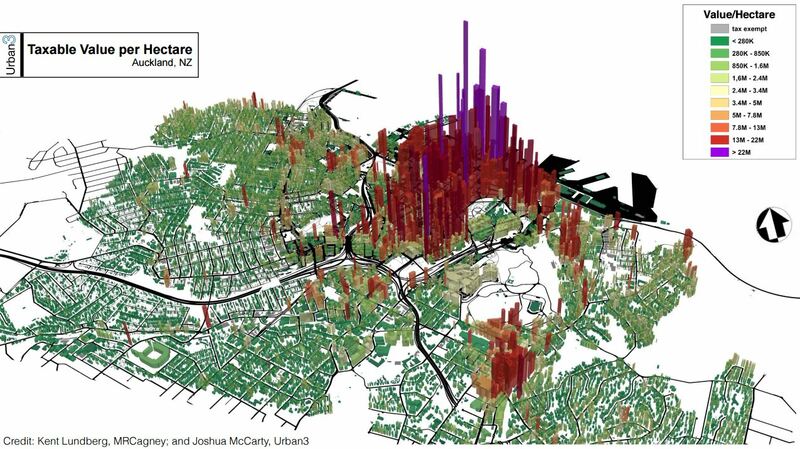 Joe has picked up on some of that for use in the image below showing the value of property per hectare in the centre of Auckland. Improving how we use our land has multiple benefits to the bottom line of the council. It can allow for us to use our infrastructure more efficiently while at the same time reducing the amount of expensive new infrastructure needed while also increasing the number of people contributing towards the upkeep of that infrastructure. In short if you want lower rates, cut back on the sprawl. Add Mayor Goff to the list for those encouraging sprawl with his fascination on park and rides. “On park and rides, he says more parking spaces, better feeder services and multi-storey parking buildings are all potential solutions for shortages of parking. He says he would have to look at the finances for a parking building at Albany park and ride, but says “if you can’t go out you have to go up”. He is of course correct that those who park at a park and ride ease congestion on the rest of the route, but at what cost? And what about the cost of having to provide roads to enable drivers to access the park and ride. Let’s look at the proposed Albany park and ride that will have at maximum 700 spaces and is likely to have single use of spaces i.e. most people will only use it for commuting to work purposes. The building has been estimated to cost $34 million (excluding land cost) and if AT wanted to run it at say an 8% return (given that AT off street car parks have to be commercially viable) the car park would have to return $10.64 per day over 365 days; or perhaps more realistically $14.94 per day over 260 days per year. Of course at the moment they produce absolutely nothing. Park and rides are part of the reason that much of our transport system is broken. They allow commuters to travel often large distances and then to enjoy free parking at others expense. In essence they encourage sprawl. If the roads that these park and ride users are so congested that we can’t allow them to use them surely a fairer system would be to ration the use of them by implementing a congestion charge. In that fashion they pay for their decision to drive and not every rate payer. Don’t forget that the car park is approximately 300m by 133m (40,000m2), which probably costs at least $40m. That effectively doubles the price required for parking to be commercially viable. All good points, and I’m pretty disappointed in Goff. Show me a park and ride in an urban situation, and I’ll show you an area that has poor walk-up and cycle-up catchment due to the traffic, if not due to the poor land-use itself. “He is of course correct that those who park at a park and ride ease congestion on the rest of the route” I’m not sure if he’s even correct on this. So they drive to the park and ride, reducing walkability in those local areas, which pushes more people into cars, and reduces the viability of any feeder buses. Then from the park and ride through the rest of the network, each of these drivers-turned-PT-user makes space on the road for another driver – perhaps one of those people who were pushed into driving because of the low walkability and lack of viable feeder buses? This wouldn’t be true if the PT was accompanied by road reallocation, of course. Then road space would be being used more efficiently, and each driver-turned-PT-user wouldn’t be making more space on the road for another driver. Goff, you asked for road-reallocation to public transport and active modes. This is what you need to insist upon, not traffic-inducing parking provision. Parking induces traffic induces parking demand. He believes it is more appropriate that the NZ Superannuation Fund is given the opportunity to fund New Zealand infrastructure projects instead of funding infrastructure projects on other countries. This is in contrast to the mostly negative responses from most commentators to date. While acknowledging that such financing needs to be suitably structured,in principle I agree with him. One other point he notes when comparing Montreal with Auckland is that we have 905 vehicles for every 1,000 inhabitants aged 15 plus, while Montreal have a vehicle density of only 440 per thousand inhabitants. This presents us with a huge and inefficient storage problem, inevitably leading to the degradation of the city as a people place. It is not the sort of Auckland that I want to live in. So no more motorways please – all infrastructure monies must be directed into public transport and without delay! If we are going to be looking at value per unit of area, i.e. value per acre, we need to look at the cost per acre as well, then net that off, we get the profit per acre. And we can take that figure, and we can work out the profitability per acre. And with that type of modeling we can start to think of what the optimal density for urban design looks like. The problem is you design a city around that ‘optimal figure’ then something happeneds, something changes, we have seen this happen many, many times in the past, we get improvements in technology, we get trams and trains, it allows people to spread out much further, we get cars same sort of thing, we get telecomunications and computers so people can comute to work, we have factory automization, so now the types of workloads change. And that is just one side of the equation in terms of transportation, what about the cost of building, I mean we get all sorts of improvements in material design, we have cross laminated wood (something that everyone is really keen on now), we use pre-tensions and post-tensioned wires now in concrete, it reduces the concrete requirements, we have stronger concrete and ICFs, and factory made modular buildings. Point is that its extremely arbitrary to try and point to an optimal city layout based on whatever your profitability per acre is at any given time, given your makeup of technology at that one point in time. And there will always be a ranjge of activities that have a different profitability per sq meter, farming for instance vs ship building.. Just because one is more profitable than the other doesn’t mean you pick to either produce ships or food..
Its a multivariant issue, and that makes it too simple to say for instance ‘the paris model is the best’, really? And even then we apparently need a targeted city centre rate. And even then there seems to be no money to maintain footpaths. Quite unlike the suburbs, where you see continuous refurbishments and resurfacing going on.